How I Gained It: I love food and am definitely a food addict. It is the only thing I am addicted to, but I can certainly sympathize with those who are addicted to cigarettes, gambling or drugs. I know I will be an addict forever, I can’t be cured, but hopefully I can learn to handle my compulsions. For 30 years, from the time I was 30, I ate anything and everything I wanted in vast quantities. I especially love carbs, like potatoes (and potato chips are still probably the hardest thing for me to resist), and sweets (cookies, cake and candy). I have actually fought my weight for most of my life. I remember cinching the belt tighter on a beautiful hand sewn dress my mother made me to wear to school, when I was only 8 years old, in an attempt to look slimmer. But I didn’t become morbidly obese until several years after I got married. I had a few successful attempts at weight loss during my 20s, even lost 100 pounds when I was 29, and the year I turned 30 I was at an almost normal weight — for about five minutes. Then I gained it all back, plus more. For the next 30 years I remained morbidly obese, peaking at 328 pounds when I was 58. I set no limits on my eating and justified it by saying I was overweight already, why bother watching the calories I was consuming now? I moved very little. I had a kitchen chair that had rollers on it, and as much as possible I would remain seated while I cooked and cleaned up, rolling all over the kitchen. I couldn’t stand very long before my knees and hips started hurting. Simply walking across the room left me winded and my heart would race. My joints were arthritic and the weight on them didn’t help that condition, in fact probably contributed to it. Breaking Point: In December of 2009, my doctor told me that my EKG seemed to show I had had a heart attack. He administered the test after I complained that my heart would pound and race after the slightest exertion. Of course, since I weighed 328 pounds, that was understandable! I feared I had done irreparable damage, but still started a pursuit to drop just a few pounds and try to get healthier. Subsequent tests with a cardiologist proved my doctor wrong and my heart was still okay. But I knew unless I continued making changes in my lifestyle, that wouldn’t be the case forever. How I Lost It: In March of 2010, I found Sparkpeople.com. This online weight loss community has been a real life-saver for me. I blog regularly there and read and comment on other blogs. The site has many great recipes and so many motivational tools to keep you inspired and living right. I religiously tracked my calories and also began a walking routine the same month I discovered this marvelous weight loss tool. I was still weighing in at close to 300 pounds, so walking wasn’t easy, but I persevered. Every day I would go just a little further, after only making it to the end of my fairly-long driveway the first day. I remember the day I made it one whole mile! I felt like Rocky and still call that spot at the end of my country road, my “Rocky Moment.” His theme song plays in my head whenever I reach that spot, even though today I keep going, and routinely walk 5Ks. I set interim goals for myself. I wanted to be in the 240s for a friend’s wedding in June of 2010 and in the 220s by my 40th wedding anniversary in September of that year. I made both goals. 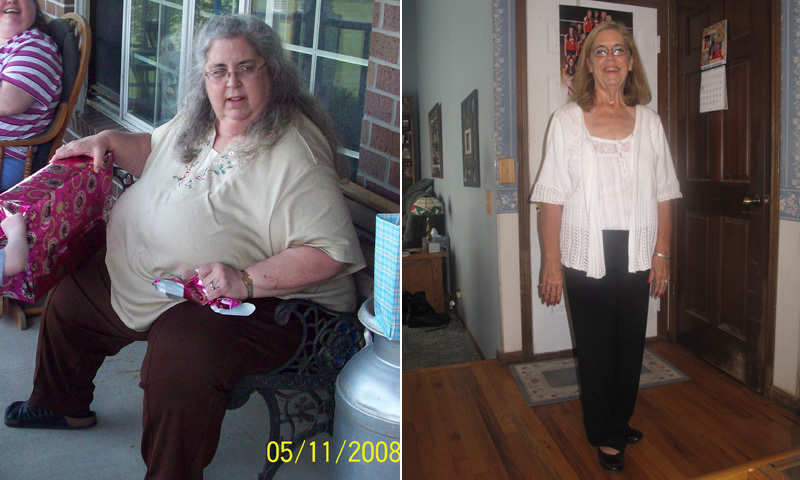 Finally I decided I wanted to weigh less than 200 pounds by my 60th birthday on Jan. 1, 2011. I made it with a couple months to spare, reaching 198.6 on Nov. 3, 2010. What a day that was! Reaching “Onederland” felt like I had finally entered the world of normalcy, after 30 years of morbid obesity. On April 15, 2011, I hit my goal weight of 160. I officially weighed less than half my starting weight. Since that time I have lost an additional 10 pounds, and weigh in around 150 most days. If I see the scale inching upwards, I cut back on my food, and increase my walking. I am vigilant about everything that goes in my mouth. I will have to remain vigilant for the rest of my life in order to keep the weight off and that is a constant struggle, sometimes moment to moment. I eat a lot of fruit, which I love. I have also upped my consumption of vegetables, with lots of salads, always with low-fat dressing. We recently bought a grill basket and I have discovered if I cut up assorted veggies and marinate them in some balsamic vinegar and grill them, they are delicious. We cooked some shrimp, mushrooms and broccoli that way and it tasted like steak! I eat lean red meat and a lot of fish and chicken. I have started cooking more healthy things for my family, like homemade pizza, with very thin crust, lots of veggies and limited cheese on top. I never eat anything fried, or coated with breading. I don’t eat my beloved potato chips, and I very rarely eat anything like cake, cookies or donuts. I have found some delicious low-fat dark chocolate candy, but try to keep my consumption of that to a minimum. Dark chocolate can be good for you in limited quantities. The limited part is what is hard with me and chocolate! With severe arthritis in almost every one of my joints (probably partly caused by my obesity all those years), I can’t do much else than walking, although I have done some biking, which I love, and also some water aerobics. Most of my weight loss is attributable to watching my calorie intake, however. I have maintained my new weight for almost 15 months. I won’t say it’s not a struggle and a challenge every day of my life, because I will always be a food addict, but when I consider all I have gained back in my life, it is well worth the effort. I have so much more energy now, and the freedom to do whatever I want. I have even begun doing some substitute teaching, a job I trained for when I graduated from college in 1974, but was always afraid to try, fearing the ridicule from students because of my obesity. It is never too late to make a change in your life. I started out, just wanting to get healthier, but along the way, discovered so many wonderful things in this world that I had shut myself off from because I was too fat to attempt them. Thanks Terry. I fight every day to keep the weight off and am not always successful. But I keep trying…. You are such an inspiration. Spark people has been a life saver for a lot of people. I know you are enjoying your new life so much. Thank you for sharing your wonderful story. I want me to be you. Lol after I read your story, I know I can do it too. I am going to do this for me. You are such an inspiration for me. Thank you. I love these stories of older women and their successes, it’s SO much harder after 40! Dear Pam,thank you so much for your inspiring story. It sounds a lot like my life. You give me hope. Wish I had your will power… incredible!! Soooo fricken inspirational to me!!! Pam Holmes, your story is so inspirational! Congrats on your success! <3 WOW!!!! That is amazing!!! Good for her!!! This is amazing and very inspiring. I truly wish so much that I could meet this lady. Wonderful. You are an inspiration. So inspiring! You are amazing. What happened to all the excess skin??? Great job Pam. Keep it up. Awesome job!!! You should be so proud! This is what I needed!! Someone MY age that succeeded!! You my dear are an inspiration to this nearly 64 year old morbidly obese (247 at 5’7″ tall) woman. I am printing out your story and pictures of the transformation you accomplished to refer to as often as I need to be reminded that change can happen at any age!! Thank you for sharing!! Your new friend in Oregon, Jan. I would love to hear from you and others in their senior years too! this made me cry! wonderfully inspiring! thank you for being brave and sharing this story. sadly I can relate only to well but stories like this keeping me at working towards my goal. I am so inspired by Pam. I totally can relate to your story. Please keep weightloss stories coming…so motivating!!! Wow what a feat ! Congrats ! Wow just wow. Good for you. i want to so bad but dont know where to start im the only one in this house who needs to loose and want to eat healthier but its so hard when the bake every day or do fried food all thetime and with two children trying to find a job its just so easy to say alright ill eat the nasty food! plus walking i live in a bad neiborhood i really do and walking at night by myself not a good idea! Really proud of you and happy for you. I hope I can be successful too. Thanks for the inspiration. WOW! I absolutely love seeing people make these awesome transformations to a healthier lifestyle! A very inspiring story, Pam! Congratulations! FINALLY! A success story from someone older than 35! Such an inspiration! Thank you for sharing. . Thank you for sharing your journey! I literally cried as I read your story. My ‘long term goal’ is just to lose just shy of 100 lbs, but I may stretch it just to say I did it! I’m down 24 lbs thus far. I CAN….and I WILL!!!! I love reading the ‘real’ stories from ‘real people’. Such an inspiration!! What an inspiring story! Congrats. Amazing . I so need to lose weight and get me back. Way to go! this is awesome. Love to hear great stories. Day by day, minute by minute and being accountable to yourself!! Awesome work!!!! What a motivating story!! Thanks so much!! Just keepiing reading every day and you will always be motivated. This is so inspirational! Thank you for sharing! I love your story. I too am a food addict and sometimes make that my excuse not to stay on track, but I know I have to do it for myself no matter how bad my addiction is. This seems so faaaaaar away! How do you deal with sweet cravings? I feel proud of you and I don’t even know you! Thanks for inspiring me to make a change! Best of luck to you and may your success in this area just lead to more success in other areas of life! Wow, that’s a dramatic difference. Good job! Thank you for this story. I’m going to the doctor today and am really struggling with anxiety about getting weighed. Thanks for showing me that weight loss is possible. 🙂 You look great. Happy that you met your goals. Keep up the fantastic job. Stay strong!! Most motivational and moving testimony I have read thus far..Thank you for sharing. Amazing! I know and understand what you mean about the onerland feeling-just reached that myself! Thanks for your amazing success story! Amazing story!! Congrats on your amazing success!